I took this picture this morning at Jeff Davis and Conti. 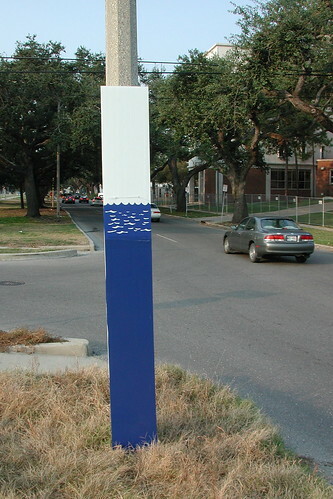 I think anyone in New Orleans would recognize what this marker means: that’s how high the water came during last year’s flood. As a point of reference, the waterline was about the level of my neck, and I’m tall. What I wonder about is: Who put this here, and is it part of a larger project? Are there more markers like this around the city? That’s the first I’ve seen, although I kind of hope it’s part of some larger project. It seems like it would be kind of an interesting memorial if those appeared all over the city. Perfect. I second that, permanent markers throughout town. I’m not exactly sure how yet, but I fully intend to do some sort of marker in my own house indicating how deep the waters went. I like the idea of permanent markers, lest future generations forget. But I think there would be resistance from people who have an eye on their real estate values. Did you notice the brass plaque on Brocato’s door marking the water line? There is a sign on Poydras at Claiborne with an arrow pointing to the water level there. I forgot what the sign said but its something about the Corps. Rosedown Plantaion has a thin black line painted around the top, put there when the owner died. The house is said to be in mourning. I’ve been thinking of ways to put a highwater mark on or in my house. possibly a reveal in the gyp board on the inside. I haven’t made any decisions yet. That’s incredibly neat and a vivid reminder. As you know, I’m a foot shorter than you (5’2), and when I’ve stood in parts of that neighborhood, the water line is waaaay over my head. It’s often eight feet up or maybe more. I like it too, although we still have plenty of “unintentional” markers around, so it may be that more people will warm to the idea. Hell, I’m one of the lucky ones, but I can’t bring myself to paint over my X yet (it’s on the porch, not the clapboard, so it’s not as visible, but still). One of our neighborhood “odd jobs” guys just painted over the DOA across the street, but none of the family has moved on the house, so I’m not sure how I feel about it. I’m sure you’ve seen the memorial at the lower 9, and I thought those poles represented flood heights at different dates, but they aren’t labeled. Does anyone know if there are plans to elaborate on those? They’re pretty powerful if so. I’m planning a garden shrine in the side lot to mark the water level in our area. Here’s an example of a formal flood memorial. I believe there is one in Fargo (where the levees held and weren’t topped) as well, but I have to go search for that pic.